What is a Duffin, I hear you ask? The answer is: a donut-like muffin! I hadn’t heard of them either until the other week when I was reviewing a café near Holborn , who had a tray of freshly baked ‘Duffins’ on their counter. I was instantly intrigued by the sweet smelling muffins rolled in cinnamon sugar and couldn’t resist buying and trying one. And, oh boy, was I glad I did, as the buttery muffin, full of vanilla, cinnamon and nutmeg flavours was very yummy indeed. As soon as I was back in front of a computer I started looking for Duffins on the web and found that they originated in North America (no surprise there then) and they seem to be this year’s big new thing. Anyhow, I found a good Duffin receipe which I tweaked a tiny bit to make them taste like the Duffin I had tried. So I added the nutmeg for example. The original receipe also asked for using extra light olive oil, for example, but I think baking with virgin olive oil is a bit of a waste, when sunflower or groundnut oil work just as well. My colleagues certainly didn’t seem to mind, when they were wolfing them down to appreciating sounds of “mmmm” and “ahhhmmm”. 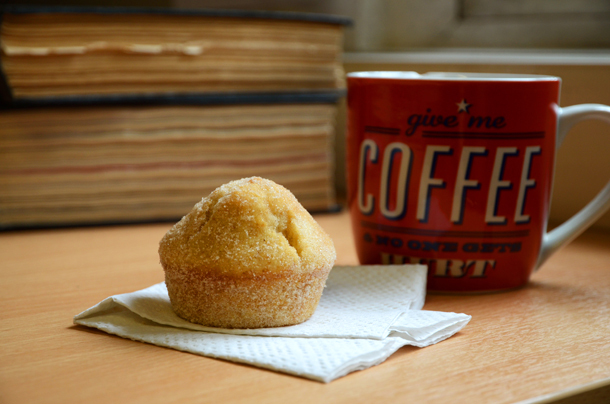 Have a go at making the Duffins, which are best eaten with a fresh cup of hot coffee! Receipe based on this one. Grease a 12-muffin tin, ideally with an oil spray, if you have it (other sites suggest pouring a tiny bit of oil in the forms). In a large jug or bowl, beat together the sugar and egg until light and fluffy. Now, pour in the oil, milk, and vanilla and almond extracts and mix to combine. In another large bowl mix the flour with the baking powder, nutmeg and salt. Now pour the fluid mix into the flour mix and stir well. Divide the batter evenly into the muffin cups, filling them about half full and bake for 15-20 minutes (toothpick test!). While muffins are baking, melt the butter for he topping in a small bowl. I found blitzing it for 20 seconds in the microwave did the trick nicely. For the topping, pour the caster sugar and all the cinnamon on to a soup plate and mix until all is combined. Once the Duffins are done and only slightly cooled down for 5-10 minutes, lightly brush the top with the melted butter. Remove each duffin from the pan and dip the top in the cinnamon sugar straight away and follow this rolling it around the whole plate, covering the whole Duffin. This entry was posted in Cupcakes, Other and tagged breakfast, brunch, cake, cinnamon, cupcake, cupcake recipe, delicious, easy, easy recipe, lowcal, lowfat, pretty, quick recipe, recipe, spiced, sweet, sweet cupcake, tasty. Bookmark the permalink.